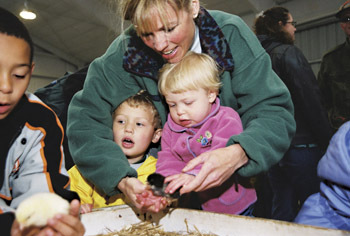 WHAT: Farm Animal Days gives children a chance to see and touch farm animals and learn about agriculture; tractors will also be on display. The event is designed for school field trips (pre-school through first grade). Families and individuals are still welcome to attend. Practice roping for the kids. One hour is sufficient to see all the exhibits. Support Farm Animal Days Now! 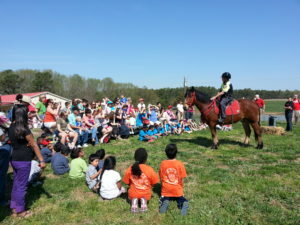 Farm Animal Days is brought to you by the departments of Animal Science, Poultry Science and Food, Bioprocessing & Nutrition Sciences in the College of Agriculture and Life Sciences at NC State University. The event is hosted by the Lake Wheeler Road Field Laboratory. If you have special needs or are a person with a disability or desire any assistive devices, services or other accommodations to participate in this activity, please call 919.515.4467 at least two weeks before the event to request accommodations. I would like to bring my family, do I have to register?No, you do not have to register prior to your arrival. Just show up. I signed up and can not remember what day I put on the form?No worries, come whenever you would like. Just check in at the registration table when you arrive at the event and we can make the corrections. Do you offer this event on the weekend, or other times of the year?No, we hold this event once a year. It is always open from 9-2 on Wednesday through Friday. How much does it cost?This event is completely free. On-Site support is welcomed from our visitors to Farm Animals Days! Or visit http://go.ncsu.edu/farmanimaldaysgifts. • Why Should Forage Testing Be Done?